Luxury suites with privileges and an exhibit of art that’s literally cutting-edge – two diversions worth being diverted to. You’re kicking back in a cushy seat with a spectacular view. You’re surrounded by friends and family. You’re enjoying a fine beverage with a superb surf and turf prepared by a chef from a top restaurant. And suddenly, a hockey game breaks out! Sure, you can simply catch a world-class Florida Panthers hockey game or concert at the BB&T Center. But you can also do it in luxurious, V.I.P. style with the arena’s premium-seating options: luxury suites or private venues Club Lexus and Corona Beach House. All come with exclusive seating and menus, complimentary parking (valet for Club Lexus), private restrooms and entrances, and a dedicated executive for those times when you need things like extra tickets or catering assistance. You’re also invited to special events like bowling with the team or Cats and Cocktails, which benefits the Florida Panthers Foundations. Club Lexus and Corona Beach House: Club Lexus is a 12,000-square-foot lounge featuring a wait staff and some of the most exclusive seats in sports, located behind both teams’ benches and center ice. Corona Beach House is an upscale yet casual setting. Both venues offer all-inclusive beer, wine and soda as well as menu options not found elsewhere in the arena – such as a guest chef program during every Panthers game. For a season’s worth of hockey games, Club Lexus is $8,557 per seat and Corona Beach House is $3,526. For all games plus events, the Club Lexus per-seat prices range from $17,000 to $19,000, while Corona Beach House costs $8,000. Luxury Suites: Based on contract length of from one to seven years, suites also provide a private setting to host 15-20 people and feature flat-screen televisions, a dedicated attendant, autographed merchandise and credits for catering ranging from high-end offerings to more typical arena favorites. Nightly suite rentals for games and concerts cost between $2,000 and $4,000. For more info, visit nhl.com/panthers/tickets/premium. through July 2, 501 Plaza Real. A large, hand-blown chandelier has fallen from the ceiling and partially shattered on the floor of the museum. A flock of stuffed crows perches on the crimson carcass of glass, feasting on the shards spattered dramatically around it. This is the haunting effect of Javier Pérez’s Carroña (Carrion), one of many eye-popping works from the museum’s dazzling new glass menagerie of an art show. Boldly challenging the notion of glass as “beautiful” material, it’s the largest presentation of the Venetian contemporary glass works exhibition ever hosted in the United States. Sprung from residencies at Studio Berengo in Murano by 33 international artists (and including Boca’s Carol Prusa), the 46 label-defying works reflect the innovation of those new to the medium collaborating with the historic furnace’s master glassmakers. Their creations are kaleidoscopic: Loris Cecchini’s life-sized hammock woven with delicate, crystalline strands; Song Dong’s chandelier of glass security cameras, titled Big Glass Brother; Yuichi Higashionna’s beanstalk of fluorescent tubes; Koen Vanmechelen’s Black Medusa with glass serpents; Kendell Geers’ arrangement of glass police batons in the wall-sized shape of a heart, titled Cardiac Arrest VIII. Think Chihuly, with an attitude. Admission: seniors $10, adults $12, children and students free. For more info, call 561-392-2500 or visit bocamuseum.org. 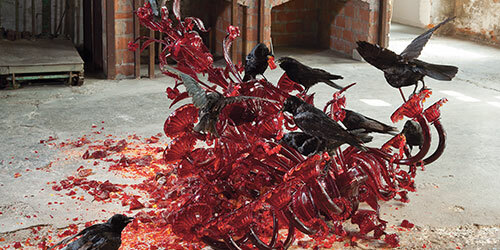 Above image: Javier Pérez, Carroña, 2011, hand-blown glass with stuffed crows, courtesy Fondazione Berengo.